July 25, 2017, 2:39 PM · In an effort to promote the coverage of live violin performance, Violinist.com each week presents links to reviews of notable concerts and recitals around the world. Vadim Repin performed the Sibelius with the Chicago Symphony Orchestra. Chicago Tribune: "Repin went to the stillness and melancholy at the heart of the Sibelius concerto. The throb of the Siberian virtuoso's vibrato and the strength of his bow arm made the slow movement feel like a continuous cantabile line stretching to infinity. One could imagine a more note-perfect reading but few as communicative as this." Vadim Repin. Photo by Gela Megrelidze. Nicola Benedetti performed Shostakovich's Violin Concerto No. 1 with the BBC National Orchestra of Wales. The Arts Desk: "She didn’t disappoint, giving a performance of Shostakovich's First Violin Concerto that demonstrated all her strengths: precision, focus, variety of colour and mood, but above all the passion and conviction needed to make sense of this long and emotionally complex work." The Telegraph: "It’s often played with a harshly intense tone, but Benedetti gave it an unaccustomed sweetness." Anne Akiko Meyers gave a live premiere of the Samuel Jones Violin Concerto with the Eastern Music Festival. Greensboro News & Record: "Throughout the work, Meyers’ lyric playing displayed the utmost tenderness, and her fervent playing was heartfelt. The fiendish technical passages? Not a problem for this player of super finesse and passion." Angelo Xiang Yu performed Saint-Saëns’ Violin Concerto No. 3 with the Grant Park Orchestra. 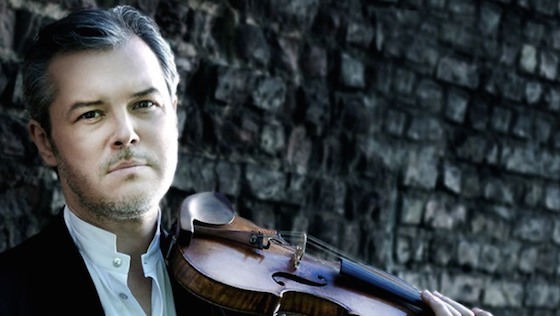 Chicago Classical Review: "The Chinese violinist has an undeniably impressive technique and sailed through the outer movements’ challenges with sturdy musicianship and a sweet, beguiling tone." July 27, 2017 at 12:15 AM · Ilya Kaler played with the Clarence (NY) Summer Orchestra this past Sunday. He began with a most delicious Meditation from Thais, a flamboyant and wondrous Zigeunerweisen, Shindler's List and the Sarasate Carmen Fantasy...he was superb as usual. He tantalized beyond the usual in the Gypsy Airs...delaying one pizzicato in the slow intro so long that a couple of the orchestra members (and me ) were spell bound waiting for him to cadence...his flickering eyebrows revealed that he was "playing us" with such a maneuver....His Carmen was flawless, wonderful harmonics and tasteful tempi throughout...He is a monster player of the first order.